"The kids played really well," said Lake Oswego coach Steve Coury. "For a first game, it was pretty close to mistake-free." The Lakers were on fire offensively at the start of the contest — especially in the second quarter — racing out to a 41-7 halftime lead before finally easing off the accelerator in the second half. Lake Oswego, led by senior quarterback Jackson Laurent (18 of 29 passing for 289 yards and five touchdowns), opened with a 4-yard first-quarter touchdown run by junior Casey Filkins, then saw West Salem tie the contest 7-7 when Simon Thompson threw a 54-yard TD pass to Anthony Gould later in the period. The second quarter, however, was all Lake Oswego. The Lakers — who forced four turnovers in the game — pushed back in front 14-7 on Filkins' 2-yard touchdown run, the first of five straight Laker TDs in the period. The defense stepped up big-time in the second quarter, getting pass interceptions from both Filkins and senior Matt Sebolsky and a blocked punt from senior Gabe DeVille — all three set up Lake Oswego touchdowns. 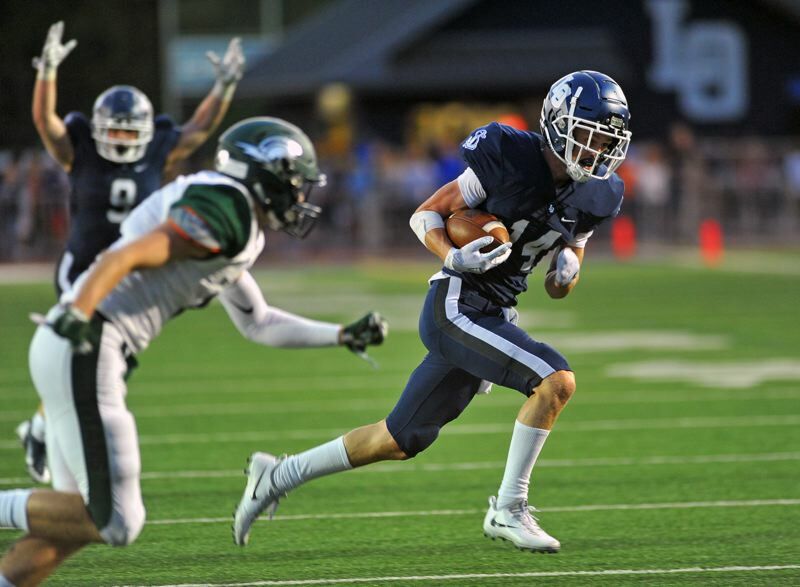 With his defense setting the table again and again, Laurent threw touchdown passes on four straight possessions — two each to junior Joe Hutson and two to junior Thomas Dukart — to boost Lake Oswego's lead to a commanding 41-7. First came a 31-yard strike to Hutson. Next was a 27-yard touchdown throw to Dukart. It was back to Hutson next, with Laurent connecting for the score from 31 yards again. And finally, Laurent hit Dukart again, this time for a 6-yard TD that extended Lake Oswego's lead to 34 points at halftime. "Those (stops) turned it into a big quarter and helped us take control of the game," Coury said. The Titans and Lakers traded scores in the third quarter, with West Salem getting a 67-yard Thompson TD pass to Gould, while the Lakers answered with a 28-yard Laurent throw to Dukart to keep the Laker lead at 48-14 entering the final period. West Salem tacked on its last score in the fourth quarter, with Thompson throwing a 27-yard scoring strike to Jamal McMurrin for the final 48-21 score. While Laurent did throw one interception in the game, Coury was impressed with his senior QB's first game as a starter. "For his first start, it was an unbelievable outing," Coury said. "He didn't try to do too much or force the ball — he was really tuned into the game plan." For the game, Filkins caught four passes for 90 yards and rushed twice for six yards and two scores. Dukart finished with five catches for 78 yards and three TDs, Hutson had two grabs for 62 yards and two touchdowns, and senior Collin Bracken rushed 12 times for 51 yards. Defensively, the Lakers limited West Salem to just 47 rushing yards on 23 carries, picked off three Thompson passes (by Filkins, Sebolsky and Keenan DeRaeve) and got a blocked punt by DeVille. Thompson completed 14 of 33 for 233 yards and three TDs in the game, but also threw three interceptions. Gould led all receivers with seven catches for 152 yards, while McMurrin made four catches for 64 yards. On Friday: Next up, Lake Oswego (1-0) travels to meet rival Jesuit (1-0) at Jesuit High School at 7 p.m. Friday. The Crusaders opened their season with a 56-7 Metro League win over Mountainside.